Rising economic inequality is a growing concern for many Americans. The widening gap between those at the top and bottom of the income scale is pushing decision makers to consider policy solutions that can begin to address these inequities. 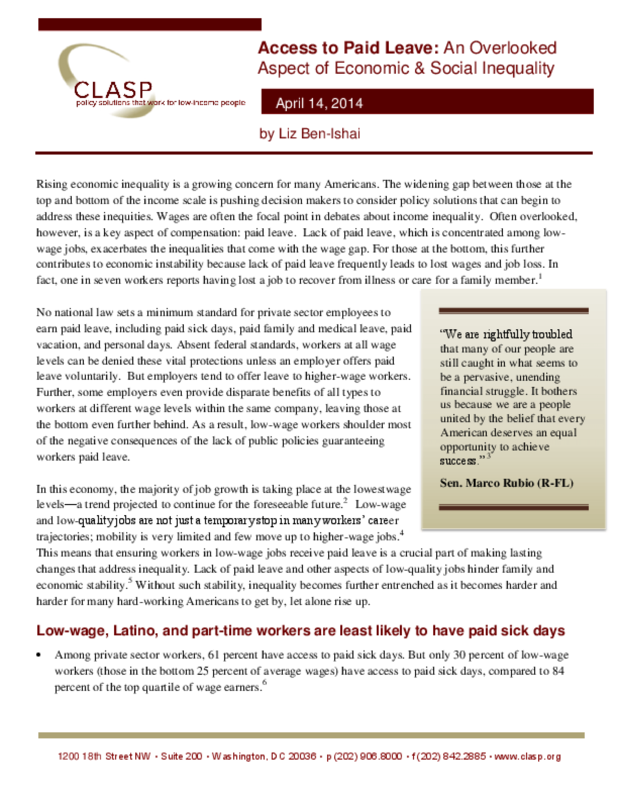 Wages are often the focal point in debates about income inequality. Often overlooked, however, is a key aspect of compensation - paid leave. Lack of paid leave, which is concentrated among low-wage jobs, exacerbates the inequalities that come with the wage gap. For those at the bottom, this further contributes to economic instability because lack of paid leave frequently leads to lost wages and job loss. In fact, one in seven workers reports having lost a job to recover from illness or care for a family member.